MCAT Question A Day - 10/19/14 - Answer! Which of the following could be a stable molecular structure? B is correct. Sulfur can form four bonds. In choice A, Cl has the wrong number of electrons. 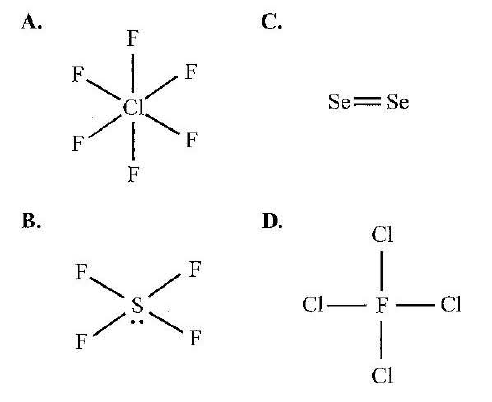 In choice C, Se is too large to form stable pi bonds, so it can't double bond. In choice D, fluorine cannot make more than one bond. This question may require a little too much detailed knowledge to be on the MCAT.